This vegan recipe is courtesy of Chef Jeffrey Borg of the Radisson Blu Resort and Spa, Golden Sands in Malta. I had this creamy vegan dessert while I was on vacation and was so delighted that I had to ask for the recipe! It’s beautiful, sophisticated, and very easy to prepare. It’s a lovely recipe for a vegan dinner party. Cook peaches and sugar on low heat, stir occasionally until soft - about 10 minutes. 1) Add 2/3 of the milk, all the sugar and vanilla to a small pot. Bring to a boil over medium heat (until it boils about 10 minutes) and immediately lower the heat to simmer. 2) Combine the remaining soy milk and cornstarch and mix until smooth. Then add the mixture to the simmering pot. (Note: it's important to mix the milk and cornstarch together before adding to the mixture. Don't just add the ingredients separately). 3) Stir frequently until the mixture boils and is thick. 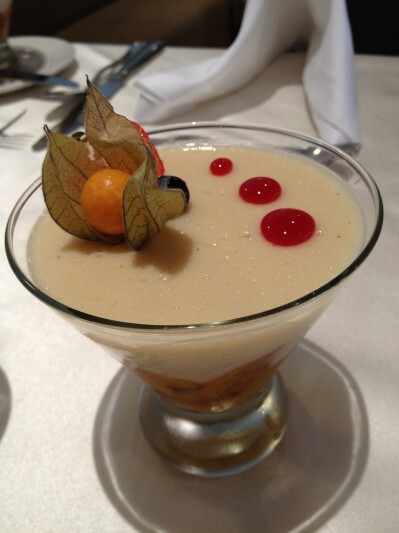 4) Place the peach compote on the bottom of a cosmopolitan glass and pour the custard on top. Top with seasonal berries. Let us know what you think of this easy vegan recipe: Soy Milk Custard Over Peach Compote!